LOS ANGELES: Katy Perry’s mother thinks she was affected by ‘’demonic influences’’ as a child. Mary Hudson – who is an evangelical pastor – has penned a parenting guide called ‘Joyful Parent = Happy Home’ for any mothers and fathers who are struggling to raise their kids because they’re so determined to do things ‘’their way’’ even though it’s dangerous. 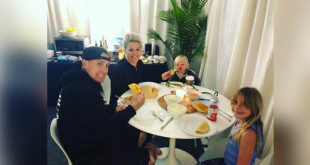 Discussing how she believes Katy and her brother and sister had been affected by ‘’demonic influences’’, she wrote: ‘’I know how difficult it can be to watch your children do things ‘their way’ especially when it looks like it is totally the opposite of God’s way. Next Prince Louis’s official photographs released!